This was a game overshadowed by 2 events for me. One was the untimely and very sad passing of promising centre forward Dylan Tombides from a 3 year battle with cancer. The other was meeting with a good friend of mine who starts his chemo this week, after being diagnosed with some serious Cancer complications out of the blue resulting in massive operations less then 24 hrs post diagnoses. The words of Shankly went through my head, and i will have the disagree with the great man this time. Dylan’s number 38 has been retired by the club and they held a very moving minutes applause before the start of the game witnessed by his brother and father. The game to me was going to be a drawn out 0-0, that would secure league survival for both teams, and started as such. Sam set out his usual shocking formation, and Pulis didn’t do much better. But the Eagles seemed to have the upper hand as they were more lively up front even if it meant Yannick Bolasie diving all over the place like Tom Daly after a night on the piss. But WHU had possession, and outside of Andy Carroll getting a couple of chances, and one falling to the ever depressing Diame, neither team was going to break the deadlock. 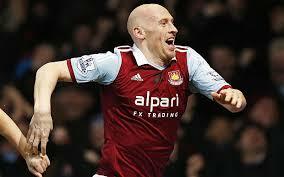 The second half was more of the same, but WHU were retreating more and more into their shells, inviting Palace on. This meant more action in our box. Eventually the inevitable happened when Pablo Armero tripped Cameron Jerome in the box. Jedinak took the pen well, and that sealed the game. There were shouts for penatlies on both sides, and that just about sums up the quality of the game all round. So Palace are now safe, and we are not with 3 tricky games to go, West Brom (A), Totts (H) and Man City away on the last day. Other results will keep us up I imagine, so we must look to next season. I watched Sam this morning on Sky talking about improving the squad, but the reception he got at the end of the game (again), points to the fact that he probably wont be there to improve anything. Last up, Palace fans, superb all day, plenty of noise and really got behind their team. WHU dominated the first half but all the decent chances fell to Norwich and they couldn’t capitalise, mainly due to some heroics from the MOTM Adrian. He was also active in the second half, but as the game went on, the shaky centre back partnership of the canaries started to give the hammers some small chances. Diame came off the bench and his influence should not be underestimated. He dominated the right back for Norwich, and had a chance saved just before he got the cross in for Collins to break the deadlock on 80 mins. Norwich pushed on to get the equalizer and were unlucky to concede a second in “Fergietime” (94m) after Diame broke free and got a fortunate deflection to double the score for WHU. One incident of note in the second half was one Mr Martin Olsson. He caught Downing in the head (by accident), but Downing put his hands to his head. This prompted Olsson to drop to the deck (not near anyone) and roll around a la Chico Flores. Thankfully, no red card for nothing this time. The WHU fans loved this (“Are you Flores in disguise”) and other less savoury taunts. So overall a good win, and another clean sheet. Some real pluses were the Collins and Tomkins partnership getting better and better, and Mark Noble once again dominating a midfield. I know earlier on in the season I laughed it off, but he could be playing himself into the national squad at this rate. Bit late for new year, but we invited the neighbours over for a party, and ensured they left with the favours. I say left, they were stolen by one man. This game was billed as a tribute to the late great Bobby Moore, who passed away 20 years ago (seems I was at the gates of Upton Park yesterday), and as a spectacle more than lived up to it. 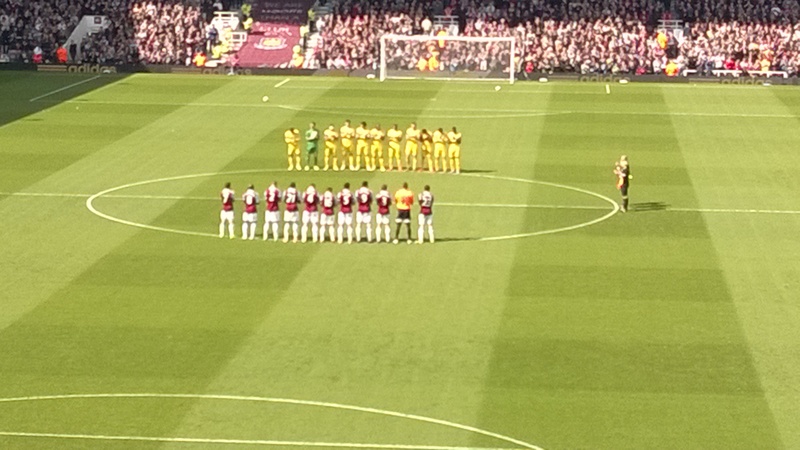 There was a one minute applause, followed by a fans mosaic celebrating the man. I was in the mosaic and I have one comment. Next time, show it on the screen at the other end, or we have no idea what we are showing ! Judging by the camera flashes (plenty from the Spurs section), it was impressive enough. 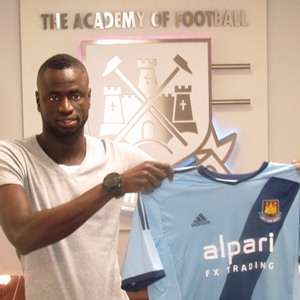 Noble was replaced by Gary O’Neill in the middle, and Guy Demel was brought in at right back. The game got underway with WHU on the attack for a change. At the six minute mark there was a another break out of “Bobby Moores’ claret and blue army”, and WHU continued piling on the pressure, with Jarvis getting in crosses, and Joe Cole looking lively. On the rare Spurs attacks it was being pointed out by the WHU faithful that Gareth Bale looked a little like a chimp. He responded by taking a goal, that on the replay was well taken ,but in play looked too easy for him. Skipping along the edge of the box he then turned to pass the ball past Jussi for the opener. WHU seemed to fall apart, and thing didn’t look good. 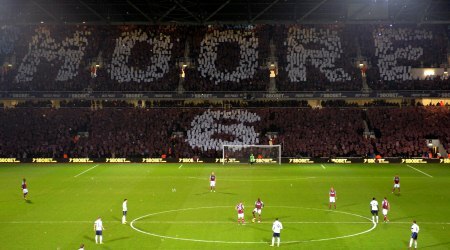 10 minutes later, Scott Parker (who was getting booed all night, nice one WHU “fans”) took out Carroll to give WHU a pen. 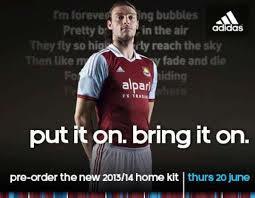 Up steps Carroll in place of Noble and smashes it home. By this time Nolan was already struggling and was replaced 10 minutes later by Taylor. With none of the usual midfield cautiousness, WHU seemed to push on and finished the half well ,with Jarvis going close with an acrobatic volley. At half time, Becks said to me “what a shambles, bloody disgrace ,etc”. No idea what game he was watching. I’m no fan of Allardyce but I tend to remember what I’m watching ! The second half was pretty quite with Bale being especially quiet if I’m honest, but you know it wont last. When he doesn’t have the ball he is constantly moving, chopping and changing markers all the time. This confuses defenders (poor lambs), and mixes up formations. Just over a quarter into the half (an eighth ? ), up pops Joe Cole, to finish off a good move between Caroll and himself, to poke it past Lloris to put the Hammers 2-1 up. Jussi spends the next 20 minutes being the best keeper in the world, making some of the most outrageous saves, including a double from Adebayour that I’m sure he still doesn’t know what happened. At this stage a point works, and 3 would be great. Enter Big Sam. Demel comes off for Pogatetz, and we lose a goal mouth scramble for a Spurs equalizer. Then, the main thorn in their side Diame is brought off for Collison, who for all his skills is not a hard hitting midfield general. Then Sam gets his get out jail card, with hardly anything left on the clock, Gareth Bale, scores a world class goal from miles out from nothing, no run up or big swing just pure class. So did Sam throw it away ? Based on Jussi in the second half probably not, but he could of maybe helped the situation. The league situation is looking very precarious now, but a win against Stoke this weekend could make all the difference.